President Barack Obama has led tributes to US actor and comedian Robin Williams, who has been found dead, aged 63, in an apparent suicide. Marin County Police in California said Williams was pronounced dead at his home after officials responded to an emergency call around noon local time. Williams was famous for films such as Good Morning Vietnam and won an Oscar for his role in Good Will Hunting. His publicist said he had been "battling severe depression". President Obama was one of many offering condolences to the actor's family saying: "Williams arrived in our lives as an alien - but he ended up touching every element of the human spirit. In the past Williams had talked, and even joked, about his struggles with alcohol and drugs. He had recently returned to a rehabilitation centre to "fine-tune" his sobriety, the Los Angeles Times reported in July. The local Sheriff's office said Williams was found unconscious and not breathing at his home near Tiburon, north of San Francisco. "At this time, the Sheriff's Office Coroner Division suspects the death to be a suicide due to asphyxia, but a comprehensive investigation must be completed before a final determination is made," police said in a statement. In a statement, Williams' wife, Susan Schneider, said she was "utterly heartbroken". "This morning, I lost my husband and my best friend, while the world lost one of its most beloved artists and beautiful human beings. I am utterly heartbroken," she said. Williams had three children from previous marriages. Born in Chicago, Illinois, in 1951, Williams joined the drama club in high school and was accepted into Juilliard School in New York, the prestigious American academy for the arts. In a 2009 interview, the actor told Reuters his children often referenced his own struggles with alcohol when he told them off for bad behaviour. "They went: 'And you had a three-year drunken relapse'. Ah, thank you for bringing that back, my little happy creatures," Williams joked. In his final Instagram post two weeks ago, he published a photo of himself and his daughter as a toddler with the message: "Happy Birthday to Ms Zelda Rae Williams! Quarter of a century old today but always my baby girl. Happy Birthday @zeldawilliams Love you!" Monty Python star Terry Gilliam directed Williams in the film, The Fisher King. "I don't think I've met anyone as exceptional as Robin was," Gilliam told the BBC. "He seemed to be a kind of receptor of all knowledge, whatever it was, whether it was in the news, or something from an encyclopaedia or a book, he seemed to know all this stuff. "He could then reassemble it in the most incredible combinations, which was always surprising, funny and outrageous. "I don't know how he did it. That was always the miracle of Robin - it was something I've never been able to explain." Media captionTerry Gilliam: "Robin was an extraordinary man"
Fellow comedian Steve Martin tweeted he "could not be more stunned by the loss of Robin Williams, mensch, great talent, acting partner, genuine soul." Comedian and talk show host Ellen de Generes tweeted: "I can't believe the news about Robin Williams. He gave so much to so many people. I'm heartbroken." 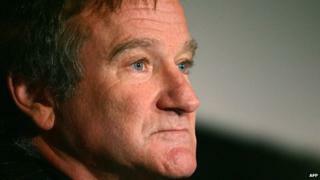 Actor Danny DeVito, who worked with Williams in Death To Smoochy, said: "So sad to think about this. Hard to speak. Hard to say. Hard to take. "All I can think about is what a joy he was to be with. I'm devastated. My heart is broken by this news." Did you meet Robin Williams? You can share your photos and experiences with us by emailing haveyoursay@bbc.co.uk using Robin Williams in the subject heading.